Angry Birds could easily be credited as the amongst the first apps that made mobile gaming mainstream. 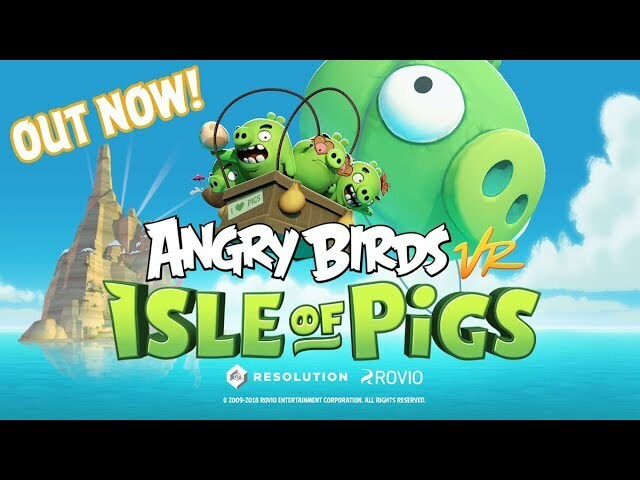 Now Resolution Games and Rovio Entertainment are looking at doing the same for VR with Angry Birds VR: Isle of Pigs. Players can now take control of the Angry Birds’ slingshot in first person to get a unique vantage point over the structures built by the egg-stealing green pigs. The game has just launched on for Oculus Rift and HTC Vive on the Oculus Store, Steam, and Viveport. Angry Birds VR: Isle of Pigs puts you in first-person control of the slingshot where you can shoot the likes of Red, Chuck, Bomb and the Blues at the piggies, within a VR environment. The game takes place on a remote island which happens to be a frequent vacation destination for the green pigs. It initially launches with over 50 levels, but we can expect the game to add more levels in time. Being in VR, the game allows you to explore the levels from different angles, though there would be preset areas for firing the slingshot. Using the VR controllers on HTC Vive or Oculus Rift, you can hold the slingshot in the virtual world in one hand and use the other hand to load the bird and take aim, just as you would with a regular slingshot. You get the trajectory dots from the game here as well, helping you determine the direction and velocity of the release. Angry Birds VR: Isle of Pigs is available now for $14.99 on the Oculus Store and Viveport, and also for Rs. 459 on Steam. Note that the will not be playable without a HTC Vive or Oculus Rift VR headset. Though Resolution Games plans to launch the game across ‘additional VR platforms’ in the coming months, our guess would be PlayStation VR as an obvious platform to extend to. Since VR is still looking for its killer app, could Angry Birds VR: Isle of Pigs reduce the barrier to entry like the original Angry Birds did in mobile gaming ten years back?